finished pieces set to be installed in a new arts trail at local beauty spot Griffin Wood. The five large sculptures will be installed over the next few weeks to create an arts trail through the woodland to provide an extra point of interest for regulars and newcomers alike. Guided tours of the woodland’s new sculpture trail are also planned – watch this space for details. The Friends of Griffin Wood are always looking for new recruits and have organised a series of free family courses at the Leaf Centre (formerly Chester Lane Community Centre) on the second Saturday of the month over the next six months. The first, Gardening forWildlife, takes place from 10am to 1pm on Saturday 10th April. Call Helen Collins on 01925 816217 to book your place. See Griffin Wood’s new sculptures take shape before your eyes! Griffin Wood comes to town on Saturday 13th March 2010 with a free carnival of wild crafts in Four Acre. 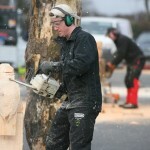 Families attending the ‘Wood Works’ festival at the Leaf Centre (formerly Chester Lane Community Centre) on Four Acre Lane will see five of the region’s top chainsaw sculptors in action and be able to try a range of activities, from apple pressing to creating garden planters and bird boxes. 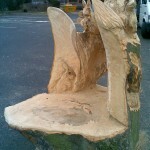 The event kicks off at 10.30am outside the Centre with a speed chainsaw carving competition between the five sculptors. Over the course of the morning, members of the public can then suggest ideas for the main pieces to be made during the afternoon and see their suggestions brought to life. Guests are encouraged to bring a pair of sunglasses if they are sensitive to sawdust. Indoors there will also be a wide range of stalls and activities throughout the day until 4pm for children and adults, provided by organisations including Groundwork, Cycling Projects, Red Rose Forest, BTCV and Forestry Commission.